On meat-free Fridays, my family has proven it’s got some pretty good cooks (Phil’s cornbread and Jaska’s Gazpacho), and now cousin Fran Auferio is adding to our list of family favorites! Sometimes it’s fun and tasty to have breakfast for dinner, so this indulgent recipe is definitely one I can’t wait to try! For all your meat-free Friday recipes, be sure to “Like” greenmomster on Facebook. Arrange bread on a single layer on two baking sheets. Bake until dry and lightly golden about 25 minutes. Rotate the baking sheets halfway through baking time. Allow the bread to cool. Grease the bottom and sides of a 9 x 13" baking dish with butter. Layer the baked bread tightly in the prepared dish -- you should have two layers. Whisk together the eggs, milk, half and half, sugar, vanilla, cinnamon, and nutmeg and pour evenly over the bread. Press lightly on the bread to submerge. Cover with plastic wrap and refrigerate for 8 to 24 hours. When ready to bake, adjust the oven rack to middle position and heat the oven to 350°. For the topping, mix the butter, brown sugar, and corn syrup together until smooth, then stir in the pecans. 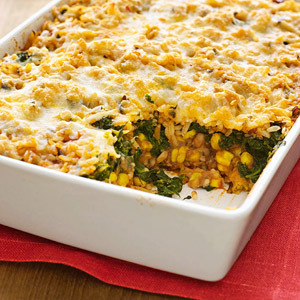 Take the casserole out of the refrigerator and unwrap. Spoon the topping over the casserole, then spread it in an even layer. Place the dish on a rimmed baking sheet and bake until puffed and golden about 60 minutes. Cool for at least 10 minutes before serving. Enjoy! A friend of mine from back in my days at William and Mary recently dropped me a line about a very green (in more than one way) university – the University of Vermont. Marna Ashburn provided guest posts (reuseable fruit bags and 3 for 1 meat-free Friday) here in the past, and she now updates us on how green our students can be! Be sure to check out her blog too! You look through life with the lens of a scientist, while I look through the lens of a writer, so it’s only appropriate that I start by talking about the use of strategic language at the university. In the large tent where we ate our meals, they had three receptacles for clean up. “Compost” was where we placed our leftover food, cups, and plates (we used compostable plates and cups rather than Styrofoam). The second was “Recycle” where the plastic flatware and napkins went. The third one, interestingly, was not labeled “Trash” but “Landfill,” an in-your-face reminder of the end state of its contents. Needless to say, we were loathe to put anything in there. The academic buildings and residence halls have a similar three-tier waste system. On every floor-- usually in just one location to manage critters--they have a compost container. The food scraps then get turned into compost at Green Mountain Compost facility and distributed to local farms, many of whom provide food to the university, so it's a nice circle of sustainability. I also noticed many Tech Dropoff locations where you can recycle items like burned-out light bulbs, dead batteries, and CDs. It’s nice to have them so accessible because I often carry a bag of “tech trash” in my car for weeks until I find an appropriate transfer point. Dining Services at UVM offer only “trayless dining.” The students carry a plate in one hand and a drink in the other to their tables. This technique reduces food waste by over 40% and eliminates the need to clean trays in the dishwasher, saving water. If, like my son, you're still hungry after the first plateful, you can always go back for seconds or thirds. Every week, the dining halls feature Meatless Mondays where they offer a vegetarian entree at a reduced price to encourage students to eat meat-free. The university has also signed on to the Real Food Challenge which is designed to increase the procurement of food that is local, ecologically sound, fair trade, or humane. To this end, they have partnerships with many of the local farms, producers, and orchards. UVM is definitely bike-friendly and prominent bike racks are part of the infrastructure. There's also a bike share program where you can borrow designated bikes at the bright yellow hubs around campus. The program is free for the first four hours, with a minimal fee after that. All you have to do is register and sign a waiver. Also, to encourage bicycle commuting, there are showers conveniently located in the student union. I’m so happy that the habits he learned while growing up are reinforced on a macro-scale now. His education includes daily reminders to tread lightly on the earth, and I’m certain these lessons will be second nature to him beyond the college years.